Mayor Villaraigosa Warns: Trump's Policies Could Be Dire For CA. 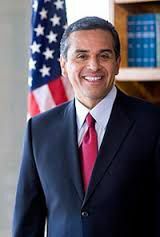 Democratic gubernatorial candidate Antonio Villaraigosa on Wednesday warned that the Trump administration’s vow to repeal the Affordable Care Act and renegotiate the North American Free Trade agreement could devastate millions of Californians and plunge the state into recession. The former Los Angeles mayor also took shots at President Trump’s immigration policies, including his promise to build a wall along the U.S.-Mexico border, suggesting he was trying to divide the country for his own political gain.